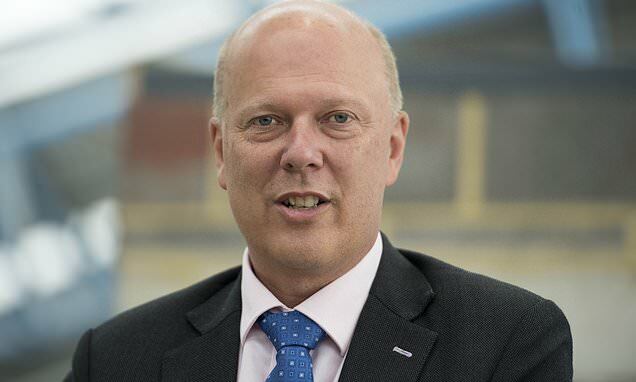 Transport secretary Chris Grayling blocked tougher anti-drone laws because his department was too busy making preparations for a no-deal Brexit. Officials had been planning tough new laws to protect airports from drone attacks by allowing the deployment of technology to intercept and take control of rogue UAVs. The new legislation was due to be published in the spring but had been delayed because civil servants were being stretched by preparing for Brexit. Airline pilots and air traffic controllers have been warning authorities about the threat posed by drones by several years. It is illegal to fly drones within 1,000 metres of a British airport boundary, punishable by five years in prison. Shadow transport secretary Andy McDonald told The Times: 'The government has glaringly failed to heed the warning and bring forward the legislation that was promised more than a year ago. Flights were briefly grounded at the airport on Friday evening after a fresh sighting at around 5.10pm, but military measures reassured operators it was safe to reopen the runway shortly afterwards. Despite flights resuming after 70 minutes, airlines were still cancelling and delaying outbound flights throughout the evening and into the night.